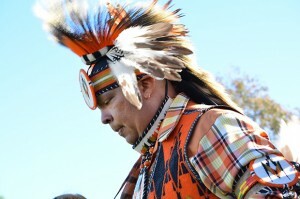 An American Indian dancer performs during the 30th Annual Powwow. Photo by John Saringo-Rodriguez / Daily Sundial. The American Indian Student Association (AISA) celebrated the 30th Annual CSUN Powwow on Nov. 30 at the Chicana/o House Lawn. The event drew hundreds of onlookers and participants, some coming from as far away as Hawaii. The Powwow coincided with the last day of Indigenous Awareness Month. American Indian dancers and singers donned their intricately patterned garb and gave traditional performances for the hundreds of spectators and attendees. The event also included many vendors selling American Indian-themed jewelry, textiles and other decorative art. It’s a population that Scott Andrews, director of CSUN’s American Indian Studies Program and powwow coordinator for the last five years, said reaches 200,000 people in Los Angeles County alone.